This was my first #SUGCON EU. Even though it was only few days, it was an excellent event. This year SUGCON Europe took place in London, capital of Great Britain. I travelled from Houston, Texas. 9 hour flight with United Airlines, arrived a day before the Conference, took few photos of the city. It all started with Registration and Sitecore Certifications Exam. There were many great Sessions at the #SUGCON, but the ones that caught my attention were the #JSS Sessions. JSS Immersion Session by Sitecore Front End Evangelist Anastasiya Flynn was really interesting. She went into the details about creating an event search page and shared some interesting and popular React Libraries. He showed a lot of cool demos with GraphQL and Sitecore JSS. He shared 17 tools for your Sitecore faster working experience. You can find all the links on his blog. Of course everyone was waiting for Adam and Kam to get on the stage and show was they had been working on and how they were improving the JSS. Now you will be able to create a JSS Tenant and JSS Site. JSS Integrates with SXA, but retains JSS architecture, if you have been working with JSS, and FE technologies, and you are familiar with SXA the below bulleted list would make sense to you. Yes all the awesome features of JSS! Congratulations to all the MVP Award Winners! Thank you to all the Organizers of the SUGCON Europe 2019 in London, it was a great event. This is the second year that I have participated in Sitecore Hackathon. I got a great pleasure working with Dylan Young and Christopher Williams this year. So the idea of this solution is to make the life of a Marketer much easier, whenever the Content Author is creating an article and new content on the page, without opening a new page, you can just work in Experience Editor and pull up a Twitter Feed, and see what is trending now. 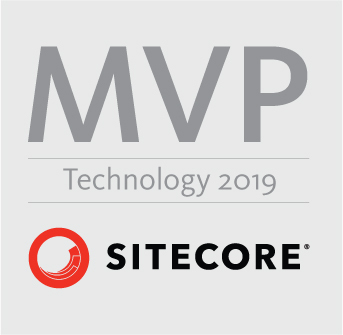 Sitecore JSS was announced last year at the Sitecore Symposium in Las Vegas. What is JSS and why do you even need it? Well what is JSS, and how can you utilize it in your project? First great thing about JSS that I really like is that you do not need to have a Sitecore instance installed on your local machine. There are few way that you can implement JSS. Enough of introduction, lets get to the development, to some interesting stuff. First you need to go to https://jss.sitecore.net/ and familiarize yourself with the the SDK. Once you have all of this installed, then we can proceed. First you need to make sure you have Layout Service enabled. What does Layout Service give you? Well Layout Service is a Presentation layer via API (JSON). It give you Personalization, MV Texting, tracking and analytics. It is included in JSS and SXA. How do you test Layout Service on your instance? Okay if everything looks good at this time, we can move on and start exploring JSS. Now we can see how it looks in the Content Editor. At this point we have proved that Layout Service is enabled and we can continue with JSS implementation. What is a Layout Service? Provides nested JSON rendering of item layout, including serialized datasource contents and reflecting any configured personalization rules and content testing. First open scjssconfig.json and modify it to your needs, see screenshot above. Once code is deployed you will be able to see content of the JssBasicApp in the Content Editor. In the next tutorial, we will be adding a component and modifying content from JSS, without accessing Sitecore.